We receive lots of questions about our puppy prices and how we set them. Prices for puppies around the world seem to be in hot debate with some people wondering at what owners are willing to pay for the joy a puppy brings to their family, while others understanding that the care that is put into breeding a dog that is healthy, happy, and perfect for their lifestyle is important. We definitely understand that it can be daunting for some future puppy owners to justify paying a high price for a puppy or a dog especially when general life expenses can make finances tight. You may have noticed that Banksia Park puppy prices have increased since the beginning of the year and you may be curious as to why. Well, here we will explain in detail our reasoning for our puppy prices and why we are conscious of trying to make our gorgeous puppies affordable for the average family as well as covering our costs. In turn, you will also gain insight into the level of care and attention that goes into raising our puppies and parent dogs as well as running our family business! It is common for our puppy pricing to slightly increase each year to keep in line with the rising costs of inflation. Inflation is the general and gradual increase in goods and services. It can be inconvenient to pay more for the same product or service, but it keeps our economy healthy. You might be wondering how does this affect our puppies? Well, products such as dog food, hay, medicine etc. and also services such as labour hire, veterinary costs and energy bills gradually increase with inflation and in turn, we adjust our puppy prices to keep in line with that. The puppy breeding industry of Victoria and in turn our family business has been affected by a politically based Bill that was passed in Parliament late last year. This has been one of the main reasons for our puppy prices to increase! With fewer mum dogs to breed with, there will be fewer puppies for us to sell and potentially fewer puppies up for sale and available for families in Victoria as well. Even though the Bill will not be fully enforced until April 2020, we have already made changes and one major change is the rehoming of many of our parent dogs. In order to comply with the laws, we will need to reduce the number of our mums to fewer than 50. This will mean a big drop in numbers, but we are very mindful of gradually rehoming them over the next two years to ensure they find the right homes to go to! In the near future, we will have fewer puppies to sell but of course they still require the same amount of attention with higher costs to raise due to less economies of scale. This means that we need to pay more for the same amount of care and focus. Victorian puppy market prices will increase but we are very mindful of not increasing our prices in line with competitors but instead offering fair pricing for outstanding puppies based on meeting our costs with the services we provide. Veterinary care is often understated, but what it achieves for our puppies, parents and animals in general, is amazing! We have great relationships with our local Vet in Sale, Victoria and Boronia Veterinary Clinic in Melbourne. All our puppies are Vet checked at 6 weeks of age. The Vet microchips each puppy and checks that they are healthy and developmentally ready for sale at 8 weeks of age. Having regular and professional medical care ensures that our puppies and parents are kept healthy and that any potential ailments are prevented or treated ASAP! This professional medical care does come at a price and we feel it is absolutely worth it. The Veterinarians come out to our property twice a week, and sometimes we even drive to Melbourne to get an expert opinion. We need to pay all these costs which include 6-week checks, rechecks, microchipping, vaccinations on puppies and parents, pre-mating checks, post whelping checks, 12-month checks, fitness to breed checks, any medical checks in the meantime, questions on everyday happenings, rehoming checks and desexing checks. As you can understand this is one of our biggest investments at Banksia Park Puppies. While we are very happy to invest so much in Veterinary care, this along with our wages are the biggest ongoing costs we have every week. At Banksia Park Puppies we test all our parent dogs by an independent genetic analysis service. This service screens the blood samples of our dogs for every DNA disease currently detectable in their breed type. The potential for genetic disease varies for different breeds and cross-breeds, so different and appropriate screening tests are used per dog. You may ask why we go to these lengths to have all our dogs tested in this way? DNA test results help us determine which parent dogs should be used to breed our puppies. Healthy puppies are important especially in the long term when we want them to have long and healthy lives with their new families. Testing is a speciality service and comes at a price but we feel it is well worth it. Not many puppy-breeding providers indulge in this service, but we intend to set a great example in our industry. It is important to note that a lot of the potential genetic diseases are rare and are not known in Australia but being proactive is the best way of keeping Australian dog’s safe. For more information and a list of potential genetic diseases in dogs visit our blog DNA Testing. To ensure our customers’ peace of mind we offer the highest health guarantee for our puppies and dogs! At Banksia Park Puppies our aim “…is to breed the healthiest, most vibrant puppies possible, with a placid temperament, lovely nature and the instinctive ability to become loyal and faithful companions. These puppies will grow to be the perfect addition for families, especially those with children.” We keep this in mind when we sell each and every one of our puppies and dogs but we understand that unforeseeable health ailments can arise! Our Puppy Consultants are on hand to assist with helpful before, during and after service and know the right services and Vets for referrals. Health Guarantees are invaluable especially during a potentially stressful and sad period if your paw-pal happens to require extra care! We don’t know of any puppy-breeding businesses that offer the level of service and financial assistance that we offer and we pride ourselves on this. Read here to see what your Banksia Park Puppy is covered for under the Health Guarantee. Here at Banksia Park Puppies we understand that life can throw curveballs! We empathise with our Banksia Park families especially when tricky life circumstances mean that you may no longer be able to care for your puppy or dog. It is a huge and difficult dilemma for a family to face, but we believe a Banksia Park puppy is a part of our extended family for life. We prefer to know where our puppies and dogs are homed and so offer this lifetime guarantee. The guarantee means that if you have carefully decided that you are no longer able to care for your Banksia Park puppy or dog that we will rehome it for you! That can be a huge weight lifted off your shoulders especially during a stressful life-event! So, how does a lifetime rehoming guarantee affect puppy prices? It only marginally affects the cost of a puppy with the potential cost to re-advertise and sell the puppy/dog to an owner or family that will be personally vetted by us to ensure they are a pawfect match! We understand that without our team we would not have such a smooth-running business. Some of our team members are trained in Animal Husbandry and grooming and many have learnt on the job with hands-on learning and further education, which we highly encourage. Here at Banksia Park Puppies in Stradbroke, we employ 30 team members from our local area, some of which have mild disabilities. At our Information Centre in Chirnside Park, Melbourne, we employ a further 10 team members who deliver impeccable sales service and puppy advice. We also hire local tradesman and handyman to maintain and improve our facilities. Team member and labour costs are a big part of the price of our puppies but we personally feel that it is well justified. The round-the-clock care, hard work and passion for animals can’t be skimped on! 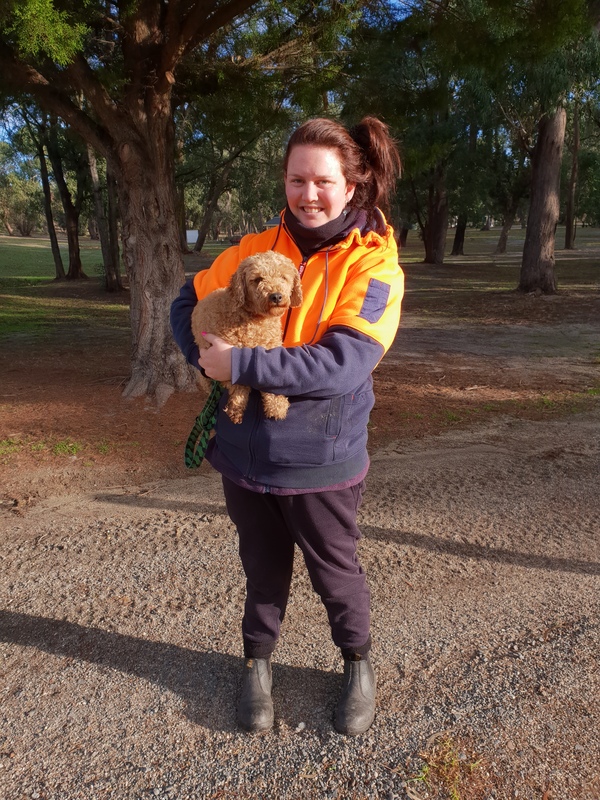 Our team extends to our Socialisation Staff, who ensure our parent dogs and puppies receive a great start to life with continual learning and development. Socialisation involves physical exercise that is provided with play and running; mental stimulation with interactive toys and new experiences; and emotional stability provided with the regular love and care from our team with pats, cuddles, conversation and support! Enrichment is very important for puppies especially during the 7-12 week developmental phase known as the Human Socialisation Period. If puppies are nurtured correctly during this period and beyond, they will grow into happy and confident adult dogs. Positive experiences and human interaction early in life lead to a well-rounded dog and therefore a happy family! To maintain a professional and successful business and to ensure that our families receive photos and the best information wherever they are across Australia, our photography and marketing team is required! With many social media platforms these days we want our families to be able to interact with each other and us wherever they are most comfortable. Photography and videography are an important part of this and our 6-week puppy photos posted on our website are usually the first image of what a future owner will see of their potential puppy! Videos also show customers their puppy’s temperament and/or that they are happy and healthy especially before travelling interstate. We also have a Banksia Park Puppies Family Group on Facebook so we and our extended Banksia family can stay in touch and watch our puppies grow! We love to see and interact with the families into the future, and we think it’s appropriate for us to interact and be available to answer questions on platforms other than email or phone. Things such as blogs and newsletters help our families learn about the best ways to look after their puppies, about their development, and to stay updated with the things happening at Banksia Park Puppies such as details on mums rehomed or our renovations. Our marketing Team maintains our professional level of service to our families and provides our customers with ongoing and extensive puppy knowledge! It’s a given to provide puppies and dogs with the basic level of care such as food, water, shelter and a comfortable environment and temperature… but we like to go beyond and provide an extra level of nutrition and comfort like they’re living in a swanky hotel! We achieve this with a nutritionally balanced dog and puppy food appropriate for their level of development; regularly freshened hay as bedding; underfloor heating and wood fires in the sheds in the colder months; fans and air-conditioning in the warmer months; and immaculate hygiene and upkeep with regular cleaning and disinfecting! Although this might seem pretty straightforward, it is labour intensive and costs can add up quick! We also look to renovate our nurseries and facilities regularly and always provide the best level of care, cleanliness, and facilities possible; all of which require ongoing investment. We cannot stop investing in our property and for this reason we require more than just our daily costs met – to invest in the best facilities requires updates to things like new gates, new concrete floors, new air conditioners and heaters when required. Investments such as swimming pools for the parents to swim in and to enrich their lives we see as ‘necessities’ but which do require high ongoing investment. We hope we have shed light on the processes involved in breeding and raising our puppies and dogs as well as background information for our puppy prices. Owning a puppy is a life-long commitment and one that shouldn’t be taken lightly. Puppy ownership costs continue beyond the initial purchase price of a puppy and include regular food, grooming, vet checks and accessories just to name a few. We urge future hopeful puppy owners to only commit to a puppy if they have given it much thought and know that they can financially and emotionally provide for their paw-pal well into the future!